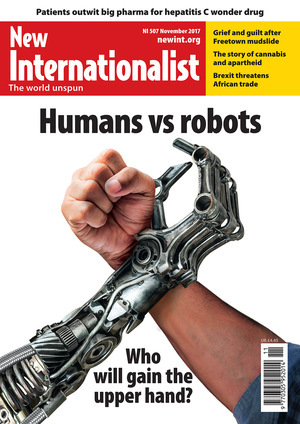 Surely, if super-intelligent robots are ever developed (NI 507) they will say, ‘here is a species hell-bent on destroying itself and its environment: it must be exterminated’, and devise a quick way of doing it. Congratulations to Payam Boromand for his excellent cartoon (Open Window, NI 507). I don’t often cry when looking at a cartoon, but this one is so poignant, and says so much about the way we treat refugees. Grace Meneer’s disingenuous anti-vaccination letter in NI 507 is part of a profoundly misleading anti-science movement, whose core claim, that the overwhelming majority of qualified scientists are callously and spinelessly lying to the public, is absurd and irresponsible: it’s the exact same dishonest attack on scientists that’s made by climate change deniers. Struck-off, disgraced ex-doctor Andrew Wakefield and the debunked film Vaxxed have no peer-reviewed scientific credibility, despite the support this mass panic has received from rightwing gutter tabloids like the Daily Mail... and Donald Trump. The ‘follow-the-money’ argument that often uncovers corporate misbehaviour falls flat on its face in the case of vaccines, which are far less profitable than treating the lifetime of severe symptoms that are caused by the diseases vaccines prevent. Ironically, it’s the anti-vaccination movement who are militantly one-sided about this issue, refusing to acknowledge the vast amount of simple, easily available and solid evidence that regularly debunks their pseudo-scientific claims. Please, please can we have more details in the Reasons to be cheerful section. Among the often rather depressing or disturbing articles, it’s a little beacon of light. But with extremely scant yet tantalizing information, eg NI 506 – who are the amazing Robin Hood Army or the mothers2mothers? Why not make a full feature of each of these heart-warming stories? After reflecting on the Making Waves article on Jamila Afghani in NI 506 where she recounts seeing a refugee Afghan woman in Pakistan begging for one rupee in exchange for a kiss.